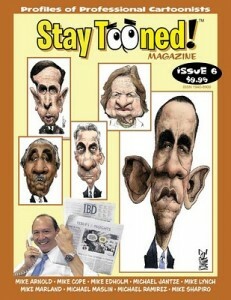 I’m a little late getting this posted but the latest issue of STAY TOONED! magazine has hit the stands (actually, it came out a couple of months ago already) and is jam packed with Mkes….. The “ALL-MIKE” issue features interviews with Mike Cope, Mike Edholm, Michael Jantze, Mike Lynch, Mike Marland, Michael Maslin, Michael Ramirez, Mike Shapiro and yes, yours truly, Mike Arnold. Here’s a clip from the Stay Tooned website: “Issue 6 (available beginning March 3rd and until it inevitably sells out) features a multitude of Mikes: new profiles (that’s interviews and art galleries) of Mike Arnold, Mike Cope, Mike Edholm, Michael Jantze, Mike Lynch, Michael Maslin and Michael Ramirez; Cartoonist Surveys conducted by David Paccia with Mike Marland and Mike Shapiro; a “True-Life Adventure” told by Mike Mignola. Photo reports share John Read’s “One Fine Sunday in the Funny Pages” travels to Disney ToonFest and Omaha, Nebraska, and his visit to the Cartoon Library at Ohio State University for the Sunday Funnies stamps First-Day-of-Issue ceremony. AND: articles/columns contributed by Tom Richmond, R.C. Harvey, Jim Ivey, Rich & Neil Diesslin and John Hambrock! So order yours today as the first five issues are sold out and I don’t know too many cartoonists that are willing to part with their copy so it’s not likely you’ll see too many of them on ebay. It’s a lot of fun to read and I highly recommend giving yourself a subscription. This entry was posted in Gag Cartoons & Comic Strips and tagged cartoonist interviews, Stay Tooned! Magazine. Bookmark the permalink.